Property left in a room with an estimated value of less than $50 will be thrown away, recycled, or donated. Property with an estimated value of $50 or greater will be documented and impounded. Students will be charged for the removal and impounding of property for labor on an hourly basis. We will attempt to contact students via their Evergreen e-mail or the phone number listed with the college about the impounded property and then students have 30 days to contact RAD to make arrangements for their property. Students can have property mailed to them, pick it up in person, or have items donated. After 30 days, if arrangements have not been made the property will be considered abandoned and the college will dispose of this property. Items that are mailed will be billed for the cost of shipping plus labor. If arrangements are made for property to be picked up, the student has 60 days from the original date of impoundment to retrieve the property. Residential and Dining Services reserves the right to enter your unit/suite/apartment for any of the following reasons: concerns you may harm yourself or others; cleaning, maintenance and animal inspections; emergency repairs; and noise complaints. Except in emergencies, when a repair has been requested, for animal inspections, or when it is impractical, the College will give at least 24 hour notice of its intent to enter a unit/suite/apartment. College Police Officers may enter community areas outside of units/suites/apartments unannounced to conduct rounds concerning health, safety or security checks, to enforce policies, or to investigate possible criminal activity. Students will have no expectation of privacy in the hallways, lounges, and other interior and exterior shared community spaces within housing. Residents will have an expectation of privacy in their individual room and suite/apartment per the access provisions set forth herein. The Evergreen State College recognizes the importance of providing reasonable accommodations in its housing policies, practices and facilities where necessary for individuals with disabilities to use and enjoy College housing. This Policy explains the specific requirements and guidelines which govern requests for reasonable accommodation in College housing. Requests for reasonable accommodation in College housing must be submitted to Access Services. Advertising/postings must be confined to community bulletin boards, with the exception of RAD Services postings; designated RAD Services bulletin boards are also reserved solely for RAD Services advertising/postings. Advertising/postings found anywhere else will be removed. The possession, use, manufacture, or distribution of alcohol except as expressly permitted by law or college policy is prohibited, as are public appearances on college premises while intoxicated. Alcoholic beverages may not, in any circumstance, be used, possessed, consumed by, or distributed to, any person under the legal age. Alcohol, including empty containers, is strictly prohibited in Substance Free for residents and guests. Residents and guests of legal age may consume alcohol in other private apartment/units. Residents sharing a bedroom with someone under legal age may not possess or use alcohol in their room. Kegs are prohibited for any use. Any alterations, modification or additions to the property or grounds are prohibited. Do not place additional locks on any door. No outdoor additions or construction of any kind is allowed. All mattresses are covered with a flame barrier that also acts as protection from allergens and insects such as bedbugs. For these important reasons, mattress covers cannot be removed; removal of the cover compromises the mattress itself and means that the mattress must be replaced. Altering an apartment/unit, including painting, removal of furniture or removal of any fixtures, is prohibited. Cost of restoration or damages will be billed to the occupant student account. All repairs must be completed by Residential and Dining Services staff. The only pets allowed in housing are fish, in tanks no greater than 10 gallons. You may not house or harbor a cat, dog, fowl, rodents, reptile, arachnid, or any other animal in your unit/suite/apartment or in the vicinity of any residential building. Students who have allegedly violated the animals policy will have a maximum of 48 hours to find an alternative off-campus living arrangement for the animal. A student who has been found responsible for violating the animal policy will be billed a service charge of $25 per impacted unit/suite/apartment to cover the costs of a routine inspection to assess the condition of the facility related to the animal. The student will also be responsible to pay for any cleaning, maintenance or pest control treatment that is deemed necessary as a result of the animal during the inspection. A student who has not complied with the 48-hour removal requirement, may be immediately evicted from housing. What work or task has the dog been trained to perform. Students with disabilities who plan to have a service dog in their campus residence must contact the Director of Access Services. Students must receive written notification of approval to have a service dog in their assigned residential space prior to bringing the dog to campus. Assistance Animals are a category of animals that provide assistance, emotional support or perform tasks that alleviates one or more identified symptoms or effects of a disability, but which do not qualify as “Service Animals” under the Americans with Disabilities Act. Assistance Animals may or may not be trained, and are not required to be certified. Students with disabilities may request an exception to the “No Animals” policy for allowance of an Assistance Animal in their campus residence as a disability-related accommodation. To allow for the time necessary to process a request for an Assistance Animal and obtain the necessary information to review the request, requests for Assistance Animals should be submitted well in advance of the start of the quarter in question. The Evergreen State College cannot guarantee that it will be able to meet the individual’s request for an assistance Animal for the first quarter or term of occupancy if the request for accommodation is received less than 45 days prior to when the individual intends to move into college housing. Owners of Assistance Animals must receive written approval of the requested accommodation from the Director of Access Services and Residential and Dining Services staff prior to bringing their Assistance Animal to campus. Students requesting an Assistance Animal as an accommodation must follow the procedures outlined in the Assistance Animal Policy. Students who do not have prior written approval to have an Assistance Animal in housing may be provided with a maximum of 48 hours to find an alternative off-campus living arrangement for the animal, and may be subject to the procedural and disciplinary steps outlined above. Upon receiving written approval from Access Services to have an Assistance Animal in housing, the student must meet with a RAD professional staff member to discuss the Owner Responsibilities Agreement. Residential and Dining Services reserves the right to immediately remove animals that are causing an immediate health and safety concern and/or are exhibiting dangerous behavior such as growling or biting. Your apartment/unit is to be used solely as a residence. You are prohibited from operating any business for profit or nonprofit purposes from your apartment/unit. You are prohibited from using College resources, such as the Internet, for business purposes (see also Evergreen’s Appropriate Use of Information Technology Resources policy). The possession or burning of candles is prohibited, except if approved in writing by a Resident Director for religious ceremonies. If approved to burn candles for a religious purpose, the candles must be attended at all times and extinguished as soon as the ceremony is over. You will be billed for any damage from candles. Candles found in violation of this policy may be confiscated by a RAD staff member and may be returned to the resident on their next trip home. You are responsible for keeping your assigned bedroom space clean and free from excessive clutter/litter and displeasing odors. Unsanitary living conditions that may be hazardous to students' health or have the potential to attract pests are prohibited. Your Resident Assistant can assist you by facilitating a Living Learning Agreement among you and your roommates. Residential and Dining Staff will inspect individual bedrooms during each quarter and prescribe cleaning tasks if needed. If you fail to clean your bedroom, Residential and Dining Services will clean the space and bill the appropriate student accounts. You and your roommates are responsible for keeping your assigned common space clean and free from excessive clutter and displeasing odors. Unsanitary living conditions that may be hazardous to students' health or have the potential to attract pests are prohibited. Your Resident Assistant can assist you by facilitating a Living Learning Agreement among you and your roommates. Your Resident Director will inspect common areas during each quarter and prescribe cleaning tasks if needed. If you and your roommates fail to clean the common spaces in your suite/apartment, Residential and Dining Services will clean the space and bill the appropriate student accounts. Community billing is a process that may be used in response to community damage, vandalism, biohazards, and related issues in the residential community. When such an issue has occurred in a shared community area (i.e., lounge, hallway, stairwell, elevator, etc.) within housing, and the specific person(s) responsible for the issue cannot be determined, RAD Services may bill a floor, building, or sub-group of residents for the cost of the cleaning and maintenance required to appropriately address the issue. Your Evergreen email account is the primary mechanism for official communications from Residential and Dining Services regarding billing, conduct, maintenance and building inspections, activities and events, and other important information. It is the responsibility of all campus housing residents to regularly read messages sent to their college email with a housing related subject line. Time sensitive information is sent out regularly throughout the year. Residents are subject to the conduct process set forth in Evergreen’s Student Conduct Code. Students, staff and faculty can initiate the conduct process by providing information to College officials regarding possible inappropriate or prohibited behavior conduct or behavior as outlined by Evergreen's Student Conduct Code, the Residential and Dining Services Rental Contract, and the Residential and Dining Services Policies Policy or any other College Policy. When it appears a violation might have occurred, an Incident Report is typically written to document the situation. The student will be sent a message via their Evergreen email account regarding a meeting with a conduct officer. The Student Conduct Officer can be a Resident Director (RD), the Assistant Director for Residential Life, or the Director of Student Conduct, or designee. At this meeting, the Student Conduct Officer will review the incident report and listen to the student's perspective with the goals of arriving at a settlement which includes deciding on any responsibility for violations, or and the imposition of any resolutions and sanctions actions resulting from any violations. Possible corrective actions resolutions and sanctions include but are not limited to: warning, educational or discretionary actions (i.e. work assignments, drug and alcohol class, service to the College), probation, loss of privileges, restitution, no contact, suspension, or the issuance of a no contact trespassing order. Please see the Student Conduct Code, WAC 174-123, for more information about the grievance conduct process. You are required to report all communicable disease or communicable insect infestation to Residential and Dining Services and seek appropriate college, public, or private treatment. On-campus housing will be made available to students with communicable diseases or insect infestation while complying with federal, state, county, and College policy and procedure in relation to the disease. Precautions will be taken by Residential and Dining Services on the advice of appropriate public or private health science professionals. You are responsible for taking your compost, trash and recyclables outside to designated containers located throughout Residential and Dining Services. You are responsible for keeping your assigned apartment/unit clean and free from excessive compost, trash, and recyclables. The following UL approved cooking equipment is allowed in housing: hot water pots, coffee makers, microwaves, toasters, blenders, popcorn makers, indoor grills, slow cookers, rice cookers, waffle makers, and small individual refrigerators. The following items are prohibited in housing: gas/propane grills, camp stoves, hot plates, and toaster ovens. Cooking equipment that is not listed here must be approved in writing by the Assistant Director for Residential Life or their designee. Permitted decorations that do not alter or damage, do not present a fire hazard within, and do not prevent egress from an apartment/unit are permitted. Permitted decorations include: artificial, nonmetallic trees; living potted trees and plants; and decorative lighting that is Underwriter Laboratories, Inc. (UL) approved and in good condition. Prohibited decorations include but are not limited to: decorations that obstruct any walkway, hallway, stairwell, door or any part of the premises and grounds; equipment that would interfere with or damage any permanent building surface or require removing or altering doors or windows; lighting that is not UL approved and/or is in poor condition; decorations attached to or in contact with building pipes, heaters, ceilings, smoke detectors, and other fire and life safety equipment. All exterior doors lock. You are responsible for protecting building security by ensuring exterior doors are locked each time you enter/exit a building. You are prohibited from propping or leaving any exterior building, apartment, or unit exterior door open. You are responsible for locking your individual bedroom door. For safety and security reasons, if a RAD staff member finds a bedroom door unlocked during inspections, maintenance, etc. the door will be locked. All doors should be unobstructed and able to be opened freely for egress in the event of an emergency. Altering door safety closures or locks is prohibited. Tampering or interfering with the operation of security systems or door locks is prohibited. Students moving into housing at the beginning of an academic term may not move in prior to the date and time outlined in the Student Housing Contract. Select students may be eligible for an exception to move into their housing assignment early, and all requests must be reviewed and approved in writing by the Assistant Director for Residential Life or their designee. Reasons for which a student may be considered for an exception include: participation in meetings or activities related to an academic program; employment with the College that relates to new student orientation or another essential component of reopening campus for the quarter; a documented disability acknowledged by Access Services; and participation as a student athlete with Recreation and Athletics. Residents who are allowed to move in prior to their Contract start date will typically be billed at a prorated daily rate for the additional days of occupancy. Residents may have the following UL approved electrical equipment in their apartment/unit: computers; printers; video and gaming equipment; sound equipment and musical instruments (see also “Musical Instruments”); lamps; fans; approved cooking equipment (see also “Cooking Equipment”); and space heaters that meet the following specifications: electric with an adjustable thermostat, over-heat protection, tip-over protection, an intact power cord and plug, a handle or hand holds for carrying. Residents must receive written approval from the Assistant Director for Facilities at RAD for other electrical equipment. Electrical equipment that is not UL approved is prohibited, including but not limited to: halogen bulbs and lamps; space heaters not meeting the specifications outlined herein; air conditioning units; and kilns. Residents are responsible for properly disposing of their electrical equipment upon move-out, and may be charged for improperly disposed of items. Tampering with an elevator or engaging in reckless or dangerous behavior that places yourself or others at risk is prohibited. If you are concerned for your personal safety in your apartment/unit, contact the on-duty Resident Director to facilitate an Emergency Transfer. The Resident Director will meet with you to discuss your concerns, and may approve an Emergency Transfer. After determining that an emergency transfer is appropriate, the on-duty Resident Director will find you a temporary room if one is available. After the situation has been resolved your Resident Director will assist you in transferring to a new apartment/unit or assist you in returning to your apartment/unit. If you choose to transfer rooms you will receive a list of vacant bedrooms to select from and a Room Transfer form. After you submit your completed Room Transfer form you will receive your keys to your new room. You will have 48 hours to move and complete the check-out process from your old room. Academic internship, individual learning contract, or study abroad which requires the resident to live outside Thurston County for a period of 30 consecutive days or more during an academic quarter. The form must be signed by your Faculty member and returned to the Residential and Dining Services Office with a copy of your Internship/Individual Learning Contract or class syllabus seven (7) days before you intend to leave campus. Information needed is your: Program/Internship Title, area where you will be staying (city, state, country), and faculty signature. Medical Leave. This requires a licensed physician's statement on office letterhead explaining why the medical condition requires you to be away from school for an extended period. Leave of absence for one quarter. Must include a statement of why you are taking a leave of absence and what your academic plan will be for the following quarter. 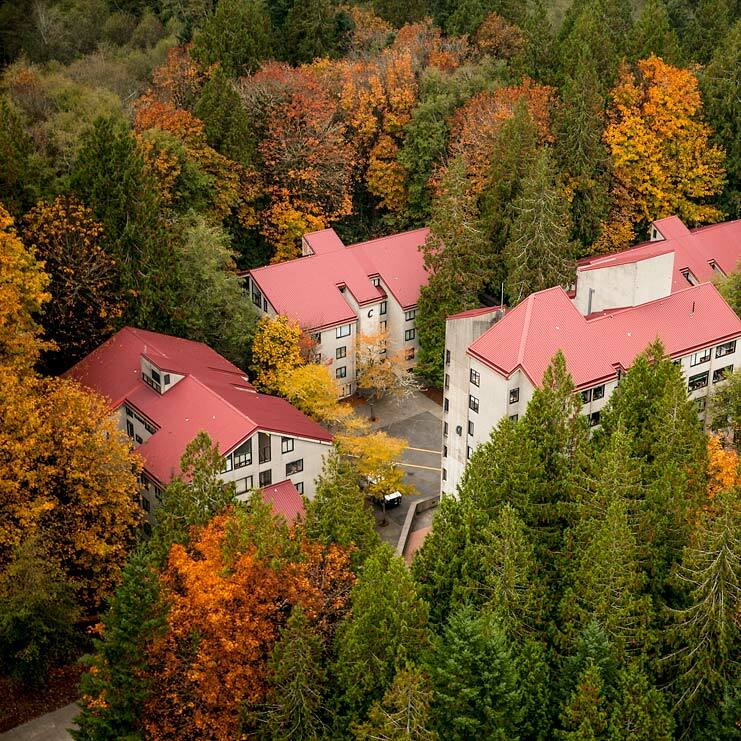 All residents and guests of student housing must observe and comply with Evergreen’s building evacuation procedures set forth in TESC's Building Evacuation Plan. This requires, among other things, that all residents and guests immediately evacuate a building whenever a fire alarm is activated and go to the designated evacuation location for student housing. When an individual room’s smoke detector is activated and there is no fire or other emergency, the occupants of the room are required to immediately call the campus Police Services non-emergency number, (360) 867-6832, to report the issue. A staff member from RAD facilities and/or fire personnel will respond. If a smoke detector is triggered as the result of a fire or other emergency, the building fire alarm should be activated and all residents and guests must immediately evacuate the building as set forth above. The resident should then call 911 to report the fire or emergency. No open flames (candles, kerosene lamps, etc.) or incendiary devices are permitted. Smoking and the burning of incense is not allowed anywhere in student housing. Neglecting appliances (including cooking appliances) while in use is extremely dangerous and therefore prohibited. Prohibited items in a resident’s apartment/unit include but are not limited: halogen bulbs and lamps; space heaters that do not meet the following specifications: electric with an adjustable thermostat, over-heat protection, tip-over protection, an intact power cord and plug, a handle or hand holds for carrying; kilns; gas grills; air conditioning units; camp stoves; hot plates; and toaster ovens. No fabric or tapestries may be hung over heaters, on lights, or across ceilings. Hanging anything from fire system sprinklers or pipes is prohibited. Furniture, clothing and other belongings should not be in close proximity to any heating unit. Tangled electrical cords and/or overloaded power strips can cause fire and are therefore prohibited. Hallways must be kept clear at all times. Playing sports or games including but not limited to frisbee, golf, soccer, field hockey, in-line skating, bicycling or skateboarding indoors is prohibited. Intentionally sounding a false alarm is prohibited; this includes but is not limited to initiating or causing to be initiated a false alarm, warning, or threat, such as that of fire, explosion, or emergency that intentionally provokes a false emergency response. The improper use or disabling of safety equipment including smoke detectors, fire alarms, fire extinguishers and emergency signs is likewise prohibited. All furniture must remain in the apartment/unit. You will be charged for any missing or damaged furniture. Community furniture that is provided in floor lounges and other social spaces in housing must remain in those spaces. Removing community furniture from floor lounges and other social spaces is prohibited. Possessing community furniture in your unit/suite/apartment is prohibited. You are responsible for the behavior of your guests. Overnight guests may stay in your room with written approval by all of your roommates. An approved guest may stay no more than three days and two nights in one month. Unapproved guests are not permitted to stay overnight. The Resident Directors inspect all individual bedrooms and common areas (bathrooms, kitchens, living rooms, and entryways) in housing during each quarter to ensure a clean, healthy and safe environment for all residents. Residents will be provided at least 24 hours advance notice of the inspection. RAD Services' cleaning standards are based on a new person being able to move into a clean and healthy environment, which is free of trash, dirty dishes, messy common spaces, and displeasing odors. Resident Directors are available to advise residents of specific cleaning expectations throughout the year. During inspections, Resident Directors will also check that fire and life safety devices and equipment are functioning properly, and your bedroom and common areas are set up in accordance with fire codes. If a living unit is found to be below standard, resident(s) will be given time to clean the unit before the unit is re-inspected. After the second inspection, RAD Services will clean a unit that fails to meet the required standard at the published rate and hold residents accountable for this policy violation. The student shall be responsible for paying the College for its costs to clean the unit at the published rate. Resident Assistants can assist in creating a new Living Learning Agreement if needed. Each agreement will address a cleaning responsibility for all roommates, which is fair, mutually agreed upon, and meets the cleaning standard. If the residents are unable to negotiate a reasonable agreement the Resident Director shall mandate an agreement. The burning of incense is prohibited, except if approved in writing by a Resident Director for religious ceremonies. You will be billed for any damage from incense. Incense found in violation of this policy may be confiscated by a RAD staff member and disposed of. For the safety of the residential community, residents must contact the Residential and Dining Office (RAD) or the RA on-duty within 48 hours if they have misplaced or lost their housing key(s). RAD Staff can assist residents in entering their room/apartment, and/or beginning the lock change process. The first two occasions upon which a resident is locked out and needs staff assistance to gain entry to their room/apartment will be free of charge; a resident will be billed $10 for the third and each subsequent lock out. Upon the third and each subsequent lock out, a resident will be required to meet with his or her Resident Director to discuss their use of keys, and show their keys in order to provide evidence that the keys have not been lost. If a resident is unable to show the Resident Director their keys at the time of the required meeting, a lock change will be ordered and temporary keys will be provided to assist the resident in the interim. Lock changes are typically billed to the resident responsible for the lost keys. Checked-out keys are due back in two business days; failure to turn them in will result in a lock change. Residents may not loan out their housing keys or College ID card to anyone. Obtaining housing keys or a College ID card illicitly, duplicating keys, retaining keys beyond authorized dates, or altering door safety closures and locks is prohibited. Your Resident Assistant will facilitate a Living Learning meeting with all of your roommates at the beginning of fall quarter, and any other time when new residents move into your space. This is your opportunity to voice any concerns you have with your roommates. Your Resident Assistant will lead a conversation on issues most residents have while living on campus. Topics such as study habits, noise, cleaning, guests and any individual concerns will be discussed. After an understanding is reached it will be documented by your Resident Assistant. Failure to follow agreement may result in referral to the conduct process if the behaviors disrupt the living situation. Possession or use of marijuana and marijuana paraphernalia is prohibited on campus. Even though Washington State law allows adults age 21 and older to possess small amounts of marijuana for recreational use, federal law prohibits marijuana possession and use of any kind. Because The Evergreen State College receives federal funds, the College must adhere to federal laws pertaining to possession and use of marijuana. Students with medical marijuana are prohibited from possessing or using marijuana of any kind and possessing or using marijuana paraphernalia on campus. Students are encouraged to visit the Student Health Center on campus to assess alternative treatment options. Marijuana and marijuana paraphernalia that is found on campus will be confiscated and destroyed by RAD staff and/or Police Services. If you are considering moving off campus, refer to the housing contract for policies around contract breaks, contract release, and check-out. Evergreen students are invited to create artwork for the residential community in the form of murals according to the procedures outlined in the RAD Mural Policy. Students at Evergreen may propose to create a mural in various designated areas within the housing community. Individuals or groups desiring to create a mural should fill out a Mural Proposal Form located on the Residential and Dining Services website and submit the proposal to the RAD front office on the 3rd floor of A-building. Once a mural proposal is submitted, the proposal will be reviewed by the Resident Director advising the Greener Organization (GO) and the Assistant Director for RAD Facilities to determine whether the mural supplies requested can be provided. RAD Facilities works with the GO to supply the training and materials necessary to create approved murals free of cost and ensure that all materials used abide by Evergreen’s eco-friendly standards (i.e., paint with no VOC’s). If the supplies have not been approved by the Assistant Director or their designee, the Resident Director advising the GO will notify the submitter via email of the proposal’s denial accompanied with a stated reason. If the supplies have been approved by the Assistant Director or their designee, the Resident Director advising the GO will notify the submitter via email that the proposal will be taken to the GO for approval. The GO will invite the submitter to attend the meeting at which the proposal will be reviewed. The submitter of the mural proposal is encouraged to attend the meeting in case the GO members have any questions. Proposals shall include a detailed sketch in color of the design being created, a timeline for completion of the project, identification of the artist—a Lead Artist should be designated if more than one artist is involved, contact information for the artist, a brief narrative describing the value that this mural will bring to the Evergreen community, and a description of the submitter’s and Lead Artist’s affiliation with the Evergreen community. that the mural does not promote the violation of RAD policy, the Student Conduct Code, or the Social Contract. The GO will notify the submitter of the status of the proposal via email. If a proposal is denied, the written denial notice will be accompanied by a stated reason. If the proposal is approved, the submitter must then schedule a meeting with the RAD Student Facilities Lead to coordinate training and materials for mural application. All paints, paintbrushes, drop cloths, and other materials for the mural will be purchased and provided by RAD. Current policy prohibits the use of spray paint and paints containing VOCs. This is done to reduce the environmental impact and maintain a healthy living environment for community members. Should the number of requests for murals exceed available space an attempt will be made to identify additional locations throughout the housing community. Once the mural is completed, RAD Services will verify that the mural matches the proposal and meets the expectations of the mural policy. Any mess or damage incurred during the painting process due to not adhering to the provided training and/or improper use of the provided supplies may be billed to the Lead Artist. This policy is intended to provide opportunities for students to create artwork in the housing community. Non- students may assist students in the design of murals, but the execution of the murals must be done by Evergreen students. Evergreen does not give legal copyright to any public artist. The mural creator is financially responsible for any damage incurred to the building as a result of their work. RAD Services is not responsible for damage to health or property as a result of participation in this project. Designated spaces for murals in the housing community are set on a rotation; mural artwork is not guaranteed to be permanent. Artists should note that a mural may eventually be removed by RAD Services for the following reasons: 1) to afford opportunities for more mural projects; 2) if mural is defaced and cannot be refurbished; 3) in order for the College to ensure a safe and inclusive environment for all members of the community. The playing of all drums and amplified instruments is prohibited, except if approved in writing by a Resident Director. Students found responsible for violating the musical instrument policy will be expected to take their instruments home on their next trip. Sunday through Thursday from 11 p.m. to 9 a.m.
Friday and Saturday from midnight to 9 a.m.
During these times noise must be contained to a bedroom unit. Designated smoking areas in housing are closed during residential quiet hours (see also "Smoking"). Residents are expected to demonstrate courtesy and considerations towards others at all times. If a neighbor requests a reduction in the noise, whether it is during or outside of the designated quiet hours, respect and compliance are expected. Residential and Dining Services reserves the right to enter your apartment/unit in order to address noise complaints. Open room transfers are generally available after the third week of the quarter. Subject to availability, a resident is allowed one free room transfer per academic year. Additional room transfers are billed at $40 and are contingent on space availability. A resident must obtain a Room Transfer form from the Residential and Dining Services Office and a list of vacant bedrooms from the Resident Director. A resident will then be required to select a room and turn in a completed Room Transfer form to receive an assignment, and obtain keys to the new room. A resident will have 48 hours to move and check out of their prior assigned room. You may use the outdoor area by your apartment/unit for outdoor toys (excluding large toys that include but are not limited to: trampolines and bouncy houses/inflatables), small wading pools, tents, etc. on a temporary basis lasting no more than three days. Residential and Dining Services staff or another College official has the right to disallow the use of outdoor toys under circumstances where it is deemed inappropriate for the College campus or otherwise presents security or health concerns. Contact the Residential and Dining Services Office for permission for use longer three days. You are responsible for keeping your assigned room, furniture and fixtures free from damage. You and your roommates are jointly responsible for damage to your common areas unless you and your roommates agree to assign responsibility. Removing furniture or fixtures from the assigned apartment/unit is prohibited. Painting is prohibited in all apartment/units. All wall repairs/painting must be completed by Residential and Dining Services staff. Quiet Housing has extended quiet hours for study, sleep and recreation, beyond the quiet hours designated for the rest of the residential community. Residents and their guests agree to low noise levels regardless of the time of day or day of the week. Sunday through Thursday from 7 p.m. to 9 a.m. Residential and Dining Services expects residents living in Quiet Housing to confront noise violations in their living space, hallways and entryways. If this confrontation is unsuccessful, contact your Resident Assistant or Police Services. Residents who create a noise disturbance in Quiet Housing will receive a warning and/or be referred to the conduct process to be held accountable to the community noise standards. If residents are unable or unwilling to resolve their dispute, it may result in their removal from the Quiet Housing community. If you live in a double room and your roommate moves out, you must buy out the unit as a single or keep the vacant side of the unit clean and empty for the possibility of receiving a new roommate. Similarly, if you live in a suite or apartment and a roommate moves out, you must be open to the possibility of receiving a new roommate in that vacant unit. A new roommate may be assigned to a vacant space in your unit/suite/apartment anytime during the remainder of the academic year. RAD Services staff will make every effort to provide advanced notification that a new roommate is coming, however a new roommate may arrive without prior notice. You may be subject to disciplinary action and charged additional rent if the vacant side of your unit is not clean and empty when a new roommate arrives, if you turn away a newly assigned roommate, or if you discourage a prospective roommate. For more information, refer also to the Reduced Occupancy section of the housing contract. Staff is available to fix any items that are furnished with your apartment/unit. Call 867-6132 to request a work order. You will need to supply your name, phone and room number, and details of the work needed and/or the situation. If an after-hours emergency occurs, you should contact the Resident Assistant on-duty by calling Police Services 867-6832. By placing a work order, you give permission for our staff to enter your apartment/unit to fix any problems concerning items that are furnished with your apartment/unit. You do not have to be present. Staff will leave a note on your door to inform you of the status of the repair. Work Orders are addressed based on the seriousness of the problem (for example, overflowing toilets have a high priority). Sleeping in unassigned areas is prohibited. Smoking is prohibited in all College buildings including student housing. Residents may smoke only in designated outdoor smoking areas on the College’s campus. A service charge will be assessed to cover the costs of cleaning and repairs in units/suites/apartments due to damage from smoking. Two public outdoor smoking areas are located within the proximity of housing: one designated smoking area is located within the Modular housing area; the second is located behind the Housing Community Center (HCC). The designated smoking area located in Modular housing closes during residential quiet hours; the designated smoking area located behind the HCC is open 24-hours and students must abide by the "Noise and Quiet Hours" policy. "Smoking" as used in this policy, refers to the inhaling, exhaling, burning or carrying of any lighted smoking equipment including cigarettes, electronic cigarettes, cigars or pipes. Door-to-door solicitation or distribution of promotional materials by anyone who is not a Residential and Dining Services staff member, or Greener Organization officer, is prohibited. All sporting equipment must be stored within rooms/apartments with the exception of bicycles. Bicycles may be stored in the covered bicycle racks located throughout the premises. No additional storage space is available beyond your currently rented apartment/unit. You are prohibited from subletting your apartment/unit/room. No persons other than you may occupy the premises without prior written approval of the Residential and Dining Services Office. Subletting will result in cancellation of your contract and eviction from Evergreen Housing. The possession and consumption of alcohol and/or illicit drugs is prohibited in Substance Free regardless of a person's age. Residents or guests may not be under the influence of alcohol or any illicit drugs while present in Substance Free Housing. Residential and Dining Services expects that residents living in Substance Free housing will confront any substance violations in their living space, hallways and entryways. If this confrontation is unsuccessful, contact your Resident Life Assistants or Police services. Residents who use alcohol and/or illicit drugs in restricted areas will receive a warning and/or be referred to arbitration to be held accountable to the community Substance Free standards. If residents are unable or unwilling to resolve their dispute, it may result in their removal from the Substance Free Housing community. It is the responsibility of hosts to ensure that their guests understand and follow the policies and intent of the Substance Free Housing community. Living in Substance Free is voluntary. Substance Free Housing is for those students that are willing to voluntarily make a commitment to maintaining a living environment free from tobacco, alcohol, marijuana, and drugs. Substance Free Housing members are also responsible for the behavior of their guests, and must assume accountability for their actions. Students signing up for such housing must be committed to fulfilling these commitments and expectations. Possessing firearms or other dangerous weapons other than to secure them with Police Services; the unauthorized use, possession or storage of any explosives, fireworks, dangerous chemicals, or substances; or the use of any instrument designed to cause harm, or realistic replica of such instrument, in such a manner which might reasonably threaten or cause fear or alarm to others is prohibited. You may post items in your window(s) provided they do not conflict with Evergreen's Student Conduct Code. No posting may hang from or be attached to the exterior of any residential building except on public bulletin boards. Throwing or dropping any objects from windows or balconies is prohibited. The use of a window as an access point for entry into or exit from a unit is prohibited. Windows should be unobstructed and able to be accessed for egress in the event of an emergency. Visit the Thurston County's Code web site for more information. Visit the Revised Code of Washington (RCW) web site for more information.